Norden Crafts: Country Cottage Needleworks NEW Santa's Village Club! Country Cottage Needleworks NEW Santa's Village Club! 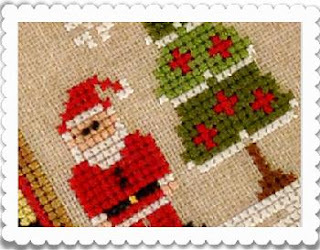 Nikki Leeman of Country Cottage Needleworks has announced her NEW MONTHLY SERIES of Santa’s Village houses! We will be offering a special automatic for these releases. The first release is scheduled to ship from Country Cottage mid-November. The designs are all stitched on 32 count Lambswool Linen, but if you would like to substitute a fabric that Norden carries in stock, we suggest 32 count Belfast Flax. All of the designs measure the same size with a stitch count of 72w x 88h. This makes them about 4 1/2" by 5 1/2" on the 32 ct fabric. SHOP OWNERS - If you would like to add Belfast Flax to your monthly auto each month, please fill out that part on the attached form. Each of the designs are perfect to stitch alone, but they are all really special when stitched together. You can stitch as many together as you like, but Nikki will be posting an image as this program goes along of the village done together with 3 horizontal rows of 4 houses each. You will need a piece of linen measuring approx 24" x 24" if you plan to stitch them like Nikki’s posted on her site. If you decide to stitch them together you don’t even have to skip any stitches, they will just flow one into the other. To make it easier to promote and plan how you may want to stitch your village, Nikki has provided a list of the pattern names in the order that they will be released. Santa’s House, Poinsettia Place, North Pole Post Office, Mrs. Claus’ Cookie Shop, Santa’s Stocking Store, Reindeer Stables, Christmas Tree Farm, Candy Cane Cottage, Santa’s Sleighworks, Gingerbread Emporium, Elves’ Workshop, and Hot Cocoa Cafe. Another special part of the designs is that each will use one button from Just Another Button Company. Using the button though is completely optional, and so it is not included with the pattern. If you like the button you can purchase it to add on, and if not, then just stitch the chart as directed without the button. You have the option of signing up to receive these button packs with each release as well. We will be shipping this auto out monthly with the supplies that you have requested. We are all super excited about this new series from Nikki, and can’t wait to start stitching it ourselves! Please call, fax or email this form to us by November 12th in order to receive the necessary supplies for your auto.